On their 2011 debut, Remember, Barika explored the nexus where West African groove meets Western rock, funk and jazz. Or, as they call it, the “ethereal dubscape.” On the recently released follow-up, Rise, the band further mines that dance-friendly region of the musical globe, both expanding and fine-tuning its worldly sound. The result is a consistently powerful record that builds on the solid foundation lain down by its predecessor and suggests even more high-flying exploits to come. Bandleader, composer and n’goni player Craig Myers seems particularly taken with the Phoenix myth, a suggestion borne out in the album’s title and its first track, “From the Ashes.” His instrument’s distinctively bright tones shimmer in a light, repetitive roll, while Caleb Bronz’s drums smolder below, building in intensity. After a pregnant pause, Barika explode in a burst of exultant horns, fueled by the propulsive groove of Bronz and bassist Rob Morse. Where Remember traded on deep, expansive grooves, Rise is built more on melodies. That’s not to say the record suffers any shortage of plunging rhythms. It certainly doesn’t. But it seems Myers has taken great care to craft melody lines that can hold up alongside that dense, low-end pulse and the hypnotic ripple of the n’goni. On “These Hills,” the horn section of Jacob Deva Racusin (tenor sax), Dave Purcell (trumpet), and guests Michael Chorney (baritone sax) and Adam Dotson (trombone, euphonium) soar over Andric Severance’s swirling keys. On the next track, the steamy, slow-burning title cut, the horns frame Myers’ n’goni melody in a moody sort of call-and-response that builds to a bombastic, shared climax before receding again. “Hold On” boasts a similarly sinewy groove and melodic interplay. Things open up at the record’s midway point, specifically on “Angatta.” Here Barika put aside their ethereal inclinations in favor of hard-charging funk-rock that’s built around a tribal rhythmic punch. It’s about as straightforward as the band gets. For those wary of world music, this tune is an easy entry point. But stick around for “Bamana Ke,” which is maybe the record’s most intriguing song and almost certainly its most world music-y. “Breathe” introduces the album’s third act, which is perhaps portentous in ye olde ethereal dubscape. It is here, and also in moments during “Fantan” and closer “Garden,” that Barika’s global fusion of styles comes most clearly into focus. It’s a fusion that benefits equally from sharp melodies, deeply rooted hypnotic grooves and a playful streak that ties it all together. 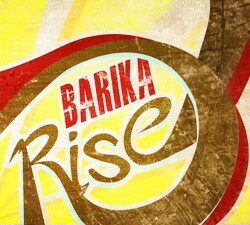 Rise by Barika is available at barikamusic.com. Barika play ArtsRiot in Burlington on Friday, October 11.